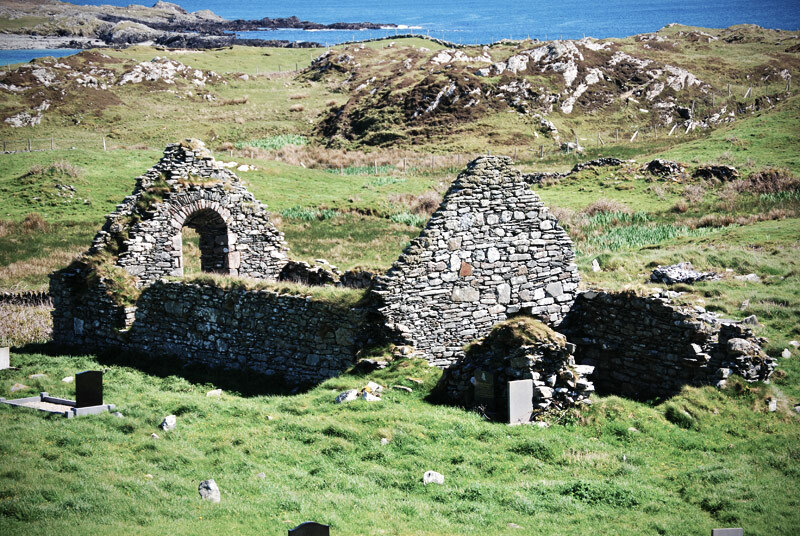 The very first reference to Inishbofin comes from the 7th century. St Colman, who was of Connacht origin and who was earlier forced into exile after a dispute concerning the dating of Easter, left Lindisfarne and set sail via Iona to the west coast of Ireland and Inishbofin in 665 A.D. According to tradition discontent arose within the monastery and Colman died in 674 A.D. Some remains of that earlier church enclosure, in the form of a number of early crosses, a Bullaun stone and two Holy Wells, can still be identified. The present-day ruin stone chapel dates to the 14th century and again according to local tradition was used as a place of worship up to 200 years ago. The original structure was ransacked and burned in 1334 by a John Darcy, a Lord Justice who sailed the western seaboard looting and burning. In the south-west corner of the graveyard is a well dedicated to St Flannan who was buried at Killaloe in 640 A.D. His association with the the site pre-dates Colman’s by some years. Close to the tiny harbour St. Scaithin is also associated with Inishbofin. Little is known locally about his background although a Scaithin is known in Co. Kilkenny. A slight trace of that monastic site can still be identified here near the Children’s Burial Ground in West Quarter village. This graveyard was used up to approx. 100 years ago and was mostly utilised for burying infants who were not baptised before death. It was their parents’ way to burying them in sacred ground. On Inishark there are a number of features associated with the monastic settlement founded by St Leo. The remains of his monastic settlement consist of a small Monastic Castle (a well preserved beehive hut called Clochan Leo). Traces of a medieval church are located within the Modern Church. There is also a small holy well near Faigh Leo (a narrow inlet) called Tobar Leo dedicated to the Saint.